Our mission here, as the Bluegrass Bandits, is to help lacrosse grow in Lexington and the surrounding areas by growing players skill level, IQ, confidence, and making memories that last a lifetime. We want to carry on the love of the game through the next generation so one day they will reflect and might want to give back to the lacrosse community as well. Though many travel teams get caught up in only winning games, and we want to win just as much as anyone else, we also realize that no one gets better if they aren't on the field playing. We work every player on our rosters into the game so they get valuable experience. Our motto is " We don't care if you have played for 7 years or 7 days, it is our job to make you better." The idea of the Bluegrass Bandits started with our Owner and Coach, Jeff Faulkner, and two teammates of his, Coaches Gabriel and Didier Fardin. They wanted to give back to the community by helping young men improve their skill and love for the game of lacrosse. A short time after the idea came to be of a high school boys team for the Bandits, Coach Faulkner and Coach Haven Buckner noticed that the girls side needed much more attention than what it was receiving in the summer. So, in the summer of 2016 the plan was established, players had joined, and memories were made. So far we have had many players from around the state come play for our high school and middle school programs. In 2017 we nearly doubled in size with the amount of players that were associated with us in either tournament competition or practice player. 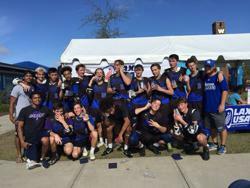 In the fall of 2017, the boys high school program went on to win the programs FIRST Championship at the Myrtle Beach Claxic on November 5th. 2018 was a big growing year for all programs! 2019 - on to bigger and better things!